The Southern District is celebrating the 500th anniversary of the Reformation in a big way! If you have a special event to add to the list below, please send the details to d.olmstead@southernlcms.org. Tickets must be purchased in advance. Click here for the movie trailer. Time: Registration – 9:00 a.m.; Worship Service – 3:30 p.m.
You are invited to a special Reformation 500 celebration, featuring guest speaker Dr. Erik Hermann and guest organist Benjamin A. Kolodziej. Dr. Hermann is associate professor of historical theology at Concordia Seminary St. Louis. Benjamin A. Kolodziej is full-time organist and director of worship at Lord of Life Lutheran Church in Plano, TX, who has also performed in many countries including the UK, Germany, Austria, Norway, Italy, and Switzerland. Zion in New Orleans is hosting a hymn fest in October, featuring glorious musical settings played on a new organ. Atonement in Metairie, LA, is holding a special Reformation service, followed by an Oktoberfest celebration on Saturday, October 28. October 2017 – 500 years in the making! The month of October has been designated the month of Reformation Celebration! We will celebrate our freedom found in the Gospel of Jesus Christ, through the grace of God, founded on the Word of God. We believe that our salvation is found only by the grace of God, through faith in Jesus Christ, and we look only to the Word of God for the direction of our daily living. Time: 3:00 p.m. – 7:00 p.m.
Lamb of God in Slidell, LA, will be celebrating the 500th anniversary of the Reformation, plus the 20th anniversary of their congregation. On Sunday, October 29, you are invited to enjoy festivities for all ages, including wiener dog races, a German fair, oompah band, and great food! Time: Worship – 10:30; Oktoberfest – noon to 3:00 p.m.
Fort Walton Beach is hosting a Reformation Festival on Sunday, October 29, beginning at 11:00 a.m. Highlights of the celebration will include: main stage live music, children’s activities, bounce houses, photo cut outs, marionettes, craft booths, and food vendors. Bring a chair or blanket to sit on. Presented by the youth and choir of Our Redeemer in Clinton! 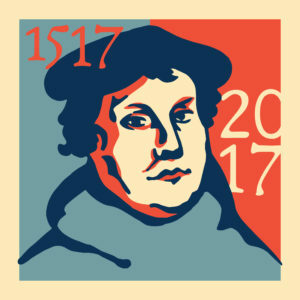 Celebrate the life and legacy of Martin Luther! With witty dialog and catchy tunes, this musical is sure to educate and entertain. The production features original songs, including “Echoes of the Hammer,” “Spare My Life,” “Relics & Riches,” “Heretic Hustle,” “Herring Barrel Hideout,” and more. Please join us for this special performance! Good Shepherd Lutheran Church in Panama City will be hosting the celebration of Divine Service to draw to remembrance and to give thanks for the 500th Anniversary of the Lutheran Reformation. At this Circuit 15 joint celebration Rev. Dr. Kevin Wendt from Grace Destin will be the guest preacher for the day. There will be a German Supper and keg of German Dunkel provided. Please RSVP with the Good Shepherd’s church office (850-871-6600) if you can join us for this joyous celebration. Circuit 14 is hosting a special joint Reformation Worship Service on Sunday, October 29, at 4:00 p.m. A light reception will follow the service. The service will be held at Lutheran Church of the Good Shepherd in Biloxi, MS. Contact The Lutheran Church of Vestavia Hills for more information. Journey back 500 years to follow Luther’s path to Reformation, step by step.